The most important meal of the day, so they say. Unfortunately breakfast and I, we have always had a tenuous relationship. Back in my school years, it never really made its way into my repertoire even at the behest of my mother. Some people just aren't morning types, you know? Between turning off the alarm and sleeping for another 45 minutes, rolling out of bed, brushing teeth, and putting on real clothes, how does a girl find time for breakfast? It was always a wonder how mom and dad could get up in the morning and fry up some eggs and buns (in Chinese families we eat buns, no toast to be found here) AND have time to eat them before heading out for the day. Now that I am well into my working years and certainly not as young and sprightly as I used to be, breakfast has begrudgingly made its way into my everyday life. The challenge these days is to find variety in a meal where it is so easy to get stuck in the egg sandwich or yogurt and granola cycle of monotony. The first time I discovered the existence of smoked trout was at the hipster brunch haven of Chicago, Lula Cafe, appropriately located in the Logan Square neighborhood. They have this smoked trout scramble (along with a few hot toddies) that makes you overlook any possible gripes about their oftentimes long Sunday morning wait. See, the thing about smoked trout is though it might seem similar to lox or gravlax, it is undoubtedly tastier, without any of the slime factor that can sometimes come with cured salmon. It's smoky, flaky, and full of flavor. 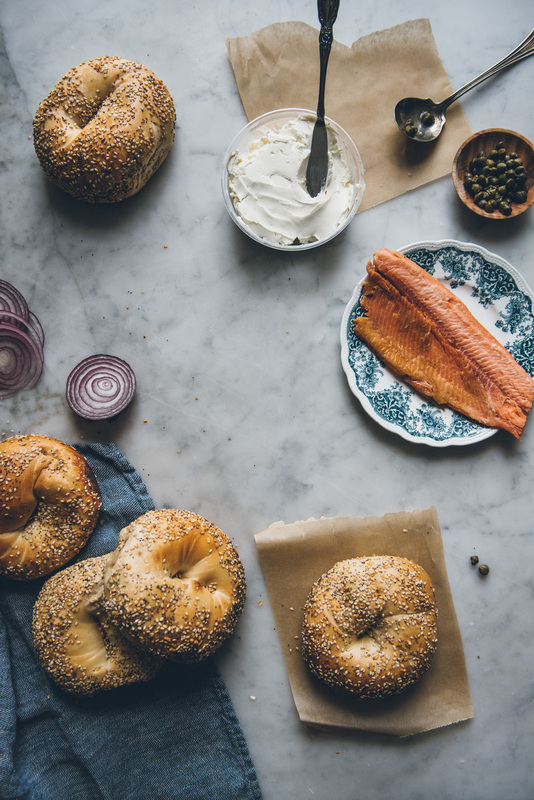 For some unbeknownst reason, it wasn't until recently I made the wondrous realization that smoked trout could be used just like lox on bagels. 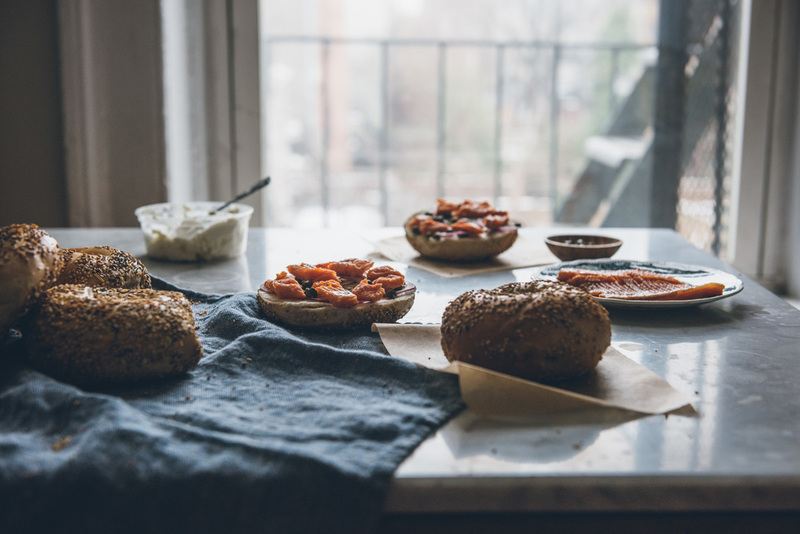 Thus began the two week marathon of smoked trout bagels for breakfast. One of the best things about this recipe (if you can even call it that) is how quickly it comes together, and for something you can make in 3 minutes flat, it tastes like it should take much more effort. It's so easy I feel like posting this as a recipe is almost cheating, but it's so delicious I just had to share in the hopes you'll find it as great as I do. The measurements provided below are very rough, since you know, it's a bagel. So go wild! Have fun! Use as much or as little of all the following ingredients to your heart's content. Smear cream cheese evenly on both sides of the bagel. Add capers, red onion and smoked trout. Serve either open faced or with the two sides sandwiched together. Eat immediately and enjoy the lovely day that follows.